For this months blogging brief with Graham & Brown, I was given the ‘Industrial’ theme. As a theme, I was told to use this word as a representation of the things we often overlook, inspiring myself to find the unnoticed, hidden beauty that lies within everything. As I read over the brief, I had an instant wave of ideas for how I could interpret the theme. However, the main idea I had that stuck with me, was based around a photo I had taken a few weeks prior to receiving the brief. After I took this photo, I knew I wanted to paint this sunset scene. However, I just wasn’t sure how I was going to do it. So, when I read this months brief, I had the brainwave idea of painting this scene in a way that could represent the ‘Industrial’ theme. As the brief focused on representing the overlooked, I decided that I would paint this beautiful sunset onto an object that may not be seen as something particularly ‘special’ at first glance. And, as I like to work with the natural elements in my art, I wanted to involve something natural in the piece. So, I decided to paint my picture onto a piece of wood. Although I enjoy finding the beauty and significance within all elements of nature, I chose to use this wood in particular, as it was something that was overlooked in my home. I chose this wood, as it was piled up in our garage to be used as fire wood. Its beauty, texture and unique shape was hiding amongst piles of chopped trees in our woodpile, waiting to be thrown onto a fire and burnt into dust. So, as I saw this wood’s unnoticed beauty, I realised that I could use it as the canvas for my painting and transform it into a piece of art. I knew that its sculptural form would certainly add another element of individuality to my artwork, and enhance the vibrant beauty of the sunset sky I wanted to paint. For the painting, I decided to create something abstract and purely focus on the colours from the sunset. 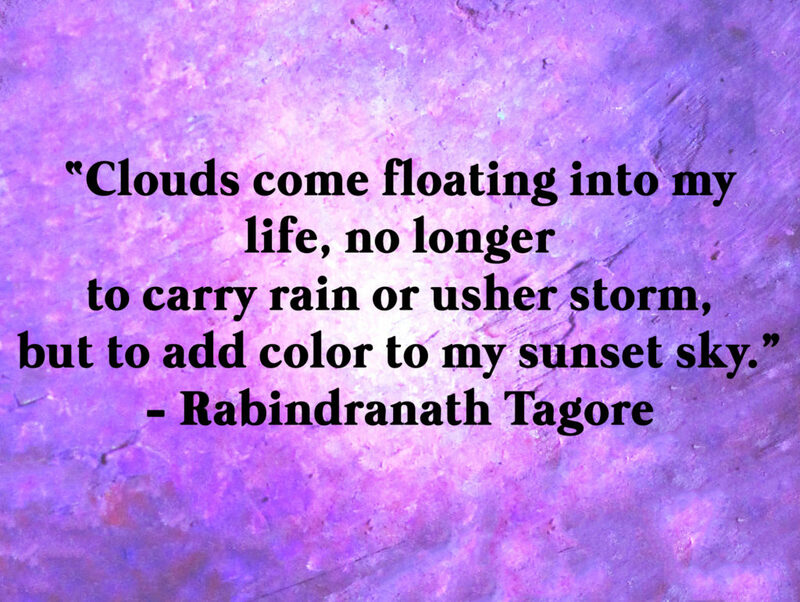 I was entranced by the purple in that evening sky, and decided to emphasise it in my painting. It was the first painting I had done in a few months, so I just wanted to let go and paint in whatever felt right. Focusing on this colour, I blended different paints straight on top of each other directly onto the wood – merging and transforming the tones into each other naturally as I went along. Using layers upon layers of paint, I aimed to use many different shades next to each other and create a subtle variation and contrast between every colour. One section I really focused on, was the beam of light in the center of the sunset scene. As I gradually blended each colour carefully onto my piece of wood, I focused on making each mark a lighter shade as it drew into the middle of the canvas. I wanted this mark to be the eye-catcher of the painting, that would draw the viewer into noticing it. Then, as they would look at the piece, my aim was for their eye to gradually be drawn away from the center and notice all of the subtle details of colour happening around it. I was really pleased with the final result of the painting, and loved the effect the piece of wood had on its overall look. I was so happy to be painting again, and enjoyed using this artwork as a way to bring out the beauty in something that would have so easily gone unnoticed before. I hope you like the piece, and that it inspires you to create some artwork of your own. I can’t wait to hear your thoughts on the painting! I hope you have a great weekend! Oh Harriet – you are so talented! 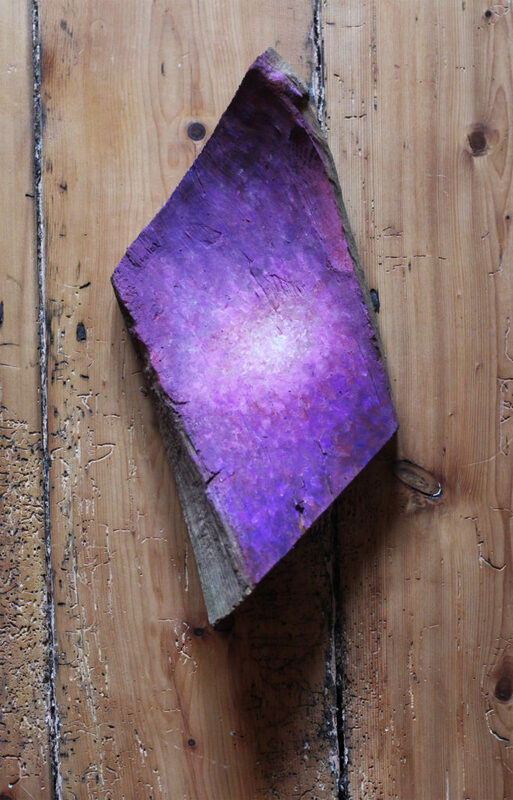 I wouldn’t have paid that piece of wood any attention before you transformed it into some ethereal! Beautiful job! Wow, that is stunning. The purples are just beautiful! Thank you so much Michele! Happy weekend to you too! The colours are absolutely beautiful Harriet 😀 wish I was arty and creative like you! I imagine painting is so therapeutic. This is so beautiful, Harriet! Purple is one of my favorite colors! So creative! Oh that sunset is just stunning! You are very talented lady! Hope you had a great weekend!! Love it! Looking at it pulls me right into it.